On Tuesday I got a message from Dean Laumbach. He sent me an email and the subject line stated: “Wow. Nicest 16V I have seen. 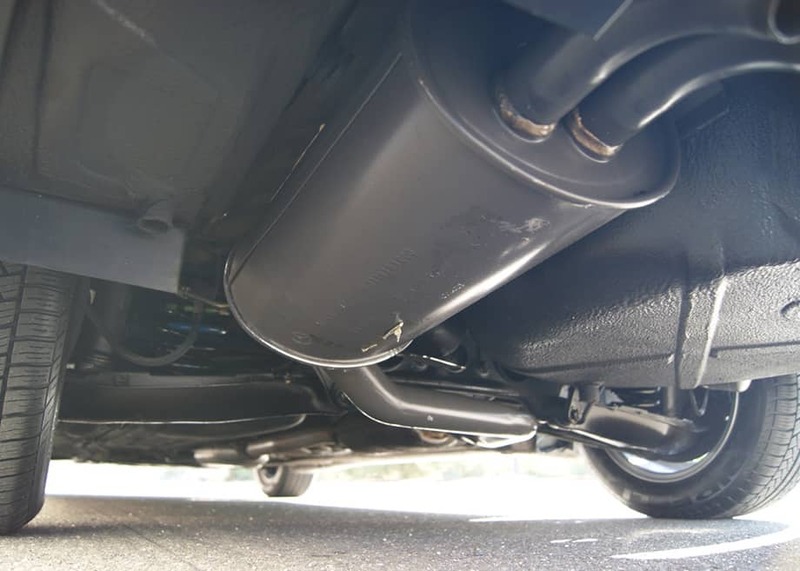 Low mileage… ” The body of the email said, “Other than chrome wheels this car looks perfect.” These strong words caught me by surprise because Dean is highly selective and it takes a lot to get him excited about a car. 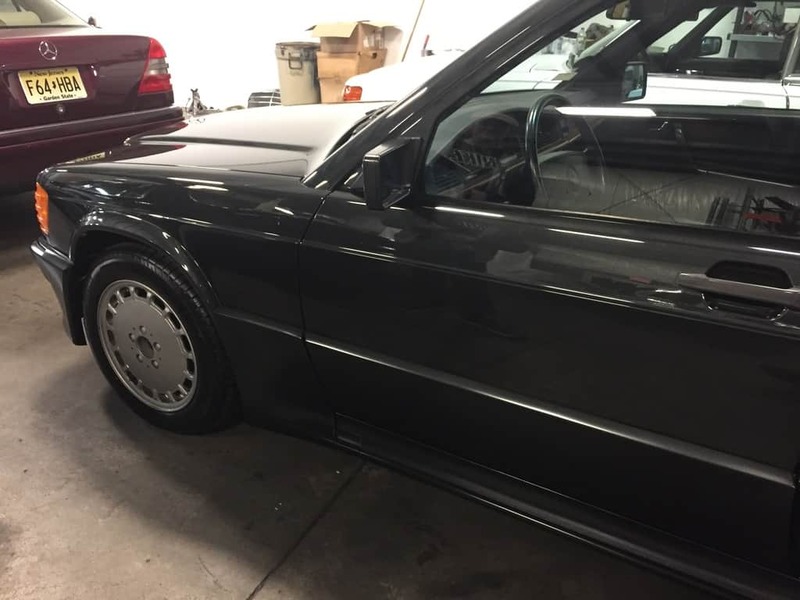 We had been searching for over two years for an investment grade Mercedes-Benz 190E 2.3-16. We had seen dozens of cars but everything was overpriced and had well over 100,000 miles on the clock. None were properly maintained. Problems ranged from faded interiors to shoddy paintwork and in some cases even rust. 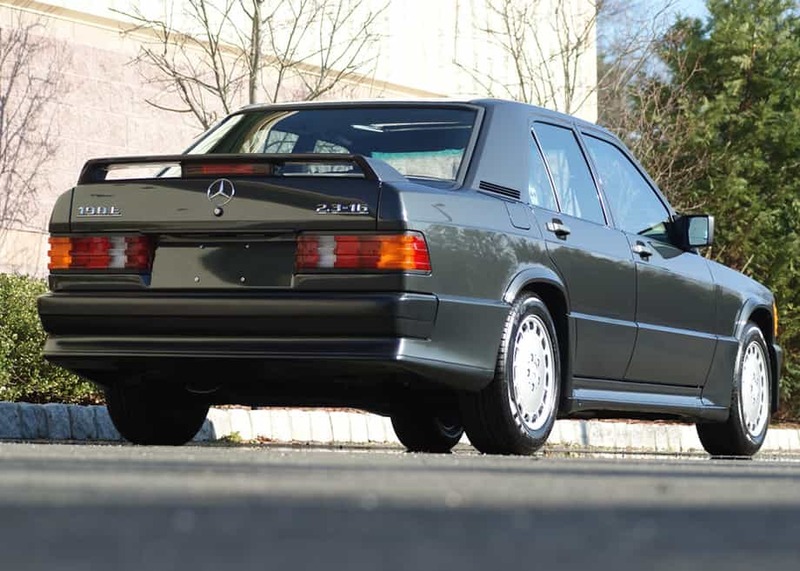 For a modern classic, the Mercedes-Benz 190E 2.3-16 is actually a fairly rare car. More than its rarity, I simply love the design, history, and aesthetic of the car. I have coveted the 2.3-16 ever since its U.S. introduction in late 1985. 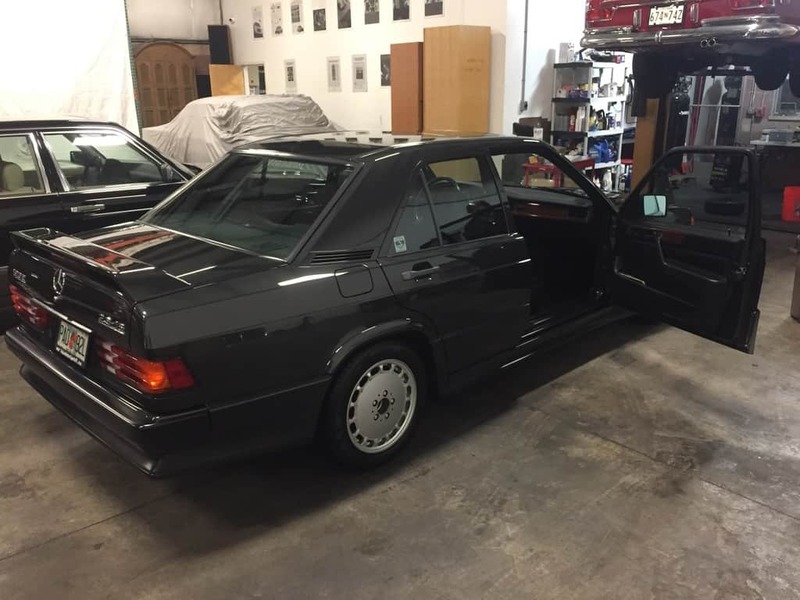 The prior owner of my 1994 E500 also owned a 1986 2.3-16. When I was in college I had the opportunity to drive his car several times. Its high-revving motor and muscular bodywork made it a head turner. Like the BMW E30 M3, the 2.3-16 was a homologation car. The 2.3-16 is no powerhouse but its really fun to drive because it has a perfect power-to-weight ratio. 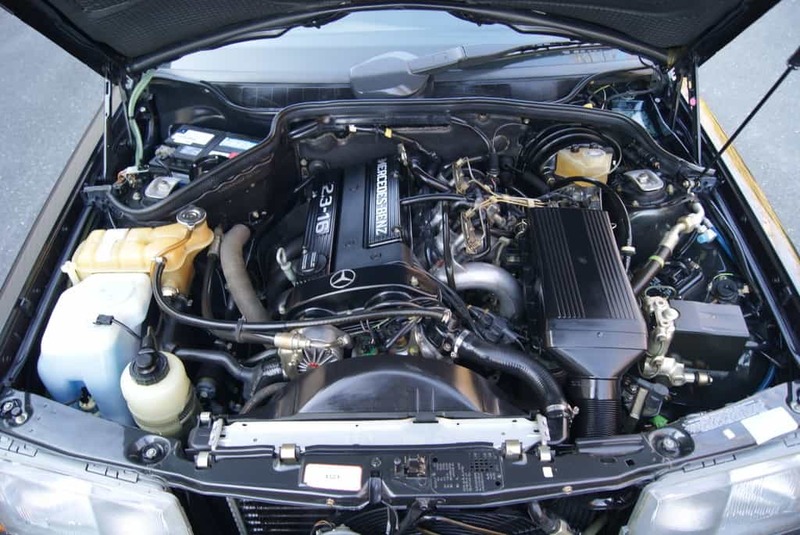 Unusual for a Mercedes, it has an awesome 5-speed Getrag gearbox. 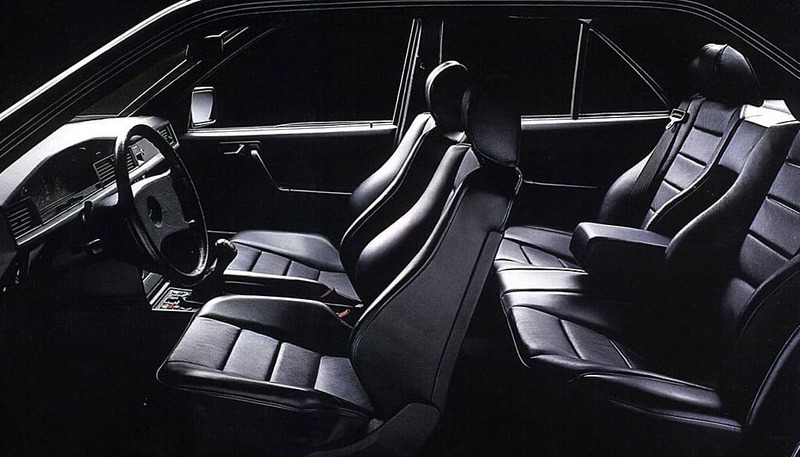 The firm Recaro seats are comfortable and supportive. 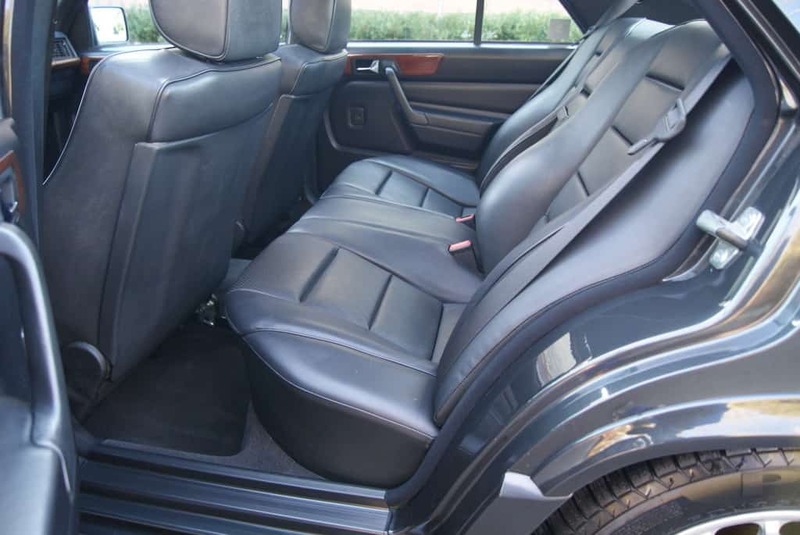 The 2.3-16V only came in two colors, Blue Black metallic and Smoke Silver. Its just a great package. The history behind these cars is long and complex and will be the subject of a future blog post. 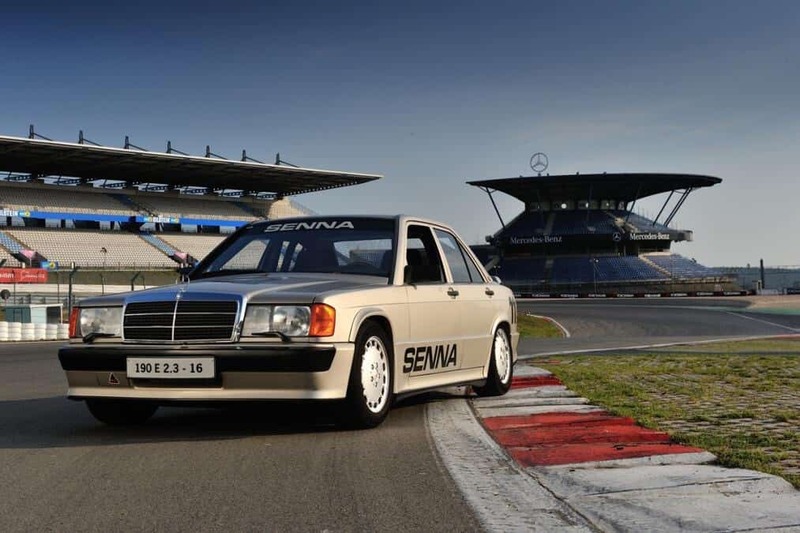 It has a race history and competed in the DTM series against the BMW E30. The motor is a small four-cylinder but was loaded with formidable technology (for the period). 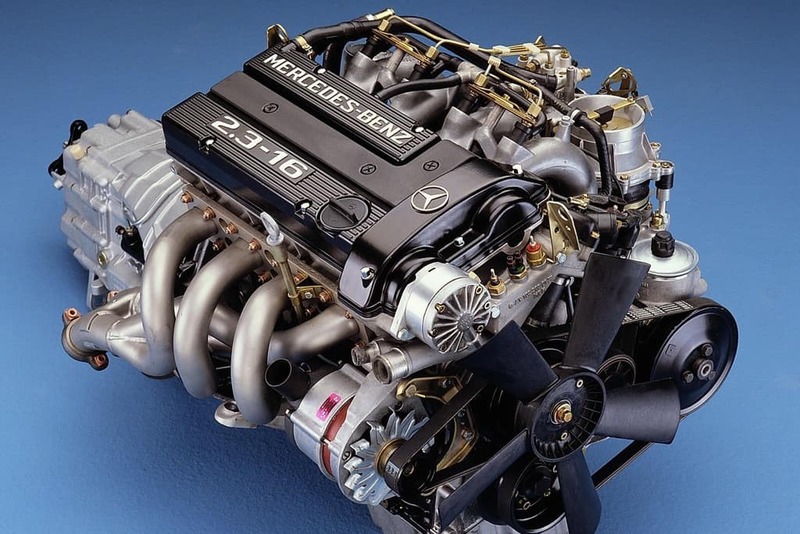 The engine was developed and manufactured in concert with Cosworth in England. An excellent timeline of the 2.3-16 story can be read here. The particular car I just acquired had been purchased new in Missouri. It’s Blue Black and has the 5-speed. 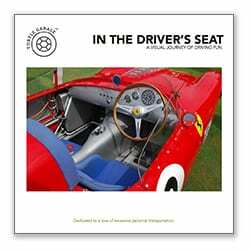 The first and only owner was a fanatical collector and he used the car sparingly. 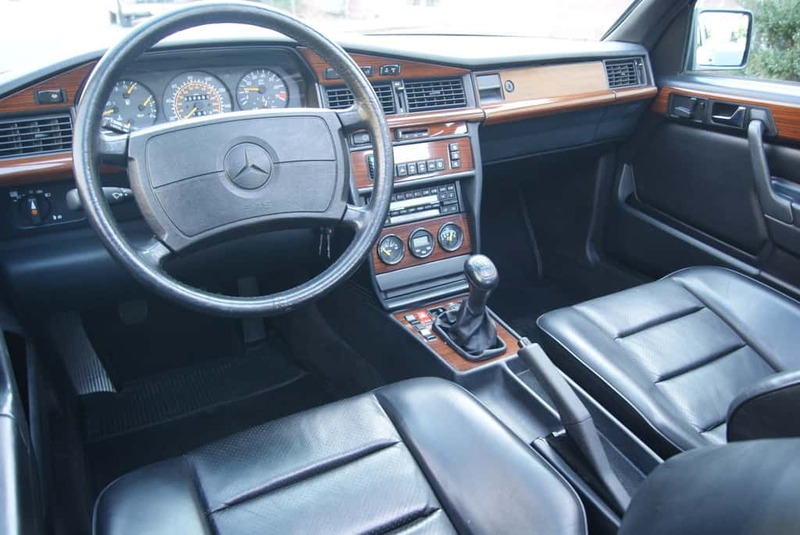 Ultimately his estate was liquidated and the 190E was sold. 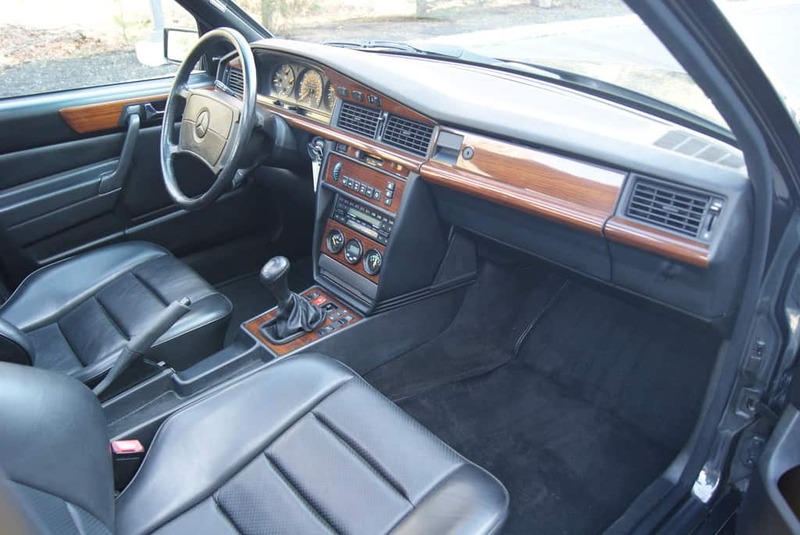 The executor was not a car guy and did not understand the difference between a plebeian 190E 2.3 and a desirable and valuable 2.3-16. 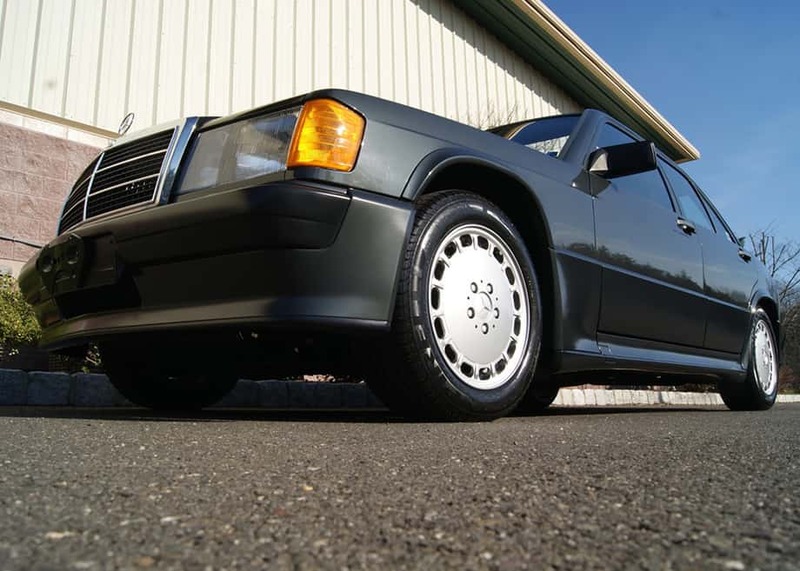 The car went to market as a “plain Jane” 190E. An educated buyer named Kevin was in the right place at the right time and picked it up. Kevin is in the collector car business and wanted the car to go into the right hands. With Dean’s help we consummated a fair deal for all. I am grateful to both Dean and Kevin for helping make my 2.3-16V dream car a reality. My collection is now finally complete! 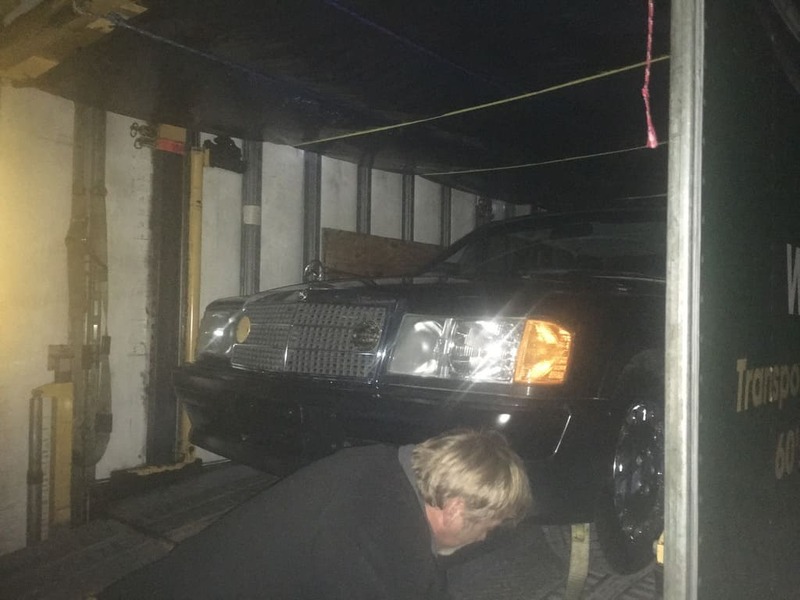 The car was originally purchased by John Greenwood from Boulevard Motors in St. Louis, MO.Boulevard became Tri-Star Mercedes when it moved 20 miles west to Ellisville, MO. A few years ago Tri-Star moved back to the St. Louis City and became St. Louis Mercedes. Mr. Greenwood owned the car until his passing in 2016, at which point his estate was sold off by CNB Bank per his wishes. He was an avid collector of Mercedes vehicles and his collection included models from the 60’s forward. His home was in the historic river town of Alton, IL. Built on top of the hill so as to have a panoramic view of the river. The garage was actually the original carriage house and stables. He converted each stall into a garage space for each car, preserving them when not being enjoyed. Upon his passing several cars where appraised and sold, many to friends and family. The 190E-16 was brought to Plaza Mercedes for an evaluation before sale. My childhood friend is a Mercedes Technician and told me of the car, knowing that I have a passion for rare and odd collector cars. I instantly contacted the service advisor and was granted permission to view the car at the dealership. Upon seeing the car I was amazed at how clean and original the car was! I bribed the advisor to call the banker and give her my number. When the bank called they told me that a nephew was interesting in the car and I could make an offer. They received several offers on the car that week, but I am happy to say that my “very high offer” was taken. 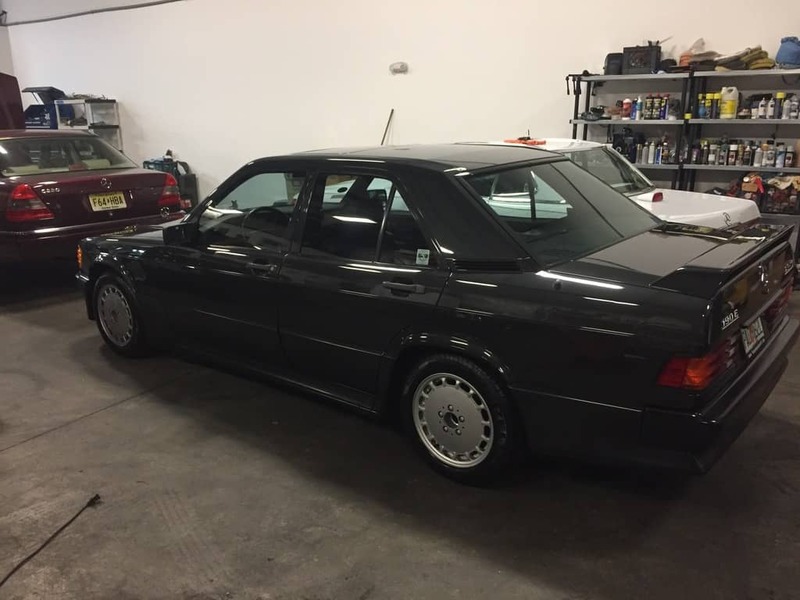 As it turns out, no one had heard of a Cosworth and the appraisal didn’t reflect the change in value over a normal 190E. I picked the car up at the bank that weekend, while filling out the paperwork, the banker asked me why I “would pay so much for the car”? I told her it was perfect and I wanted it for my collection, to which she replied “A young man on our staff wants to drive it, if you will let him. He said that a Cosworth was on his bucket list!” I looked at her with my best poker face and said “maybe, have him call me” She then asked “what is a Cosworth? Needless to say, I smiled and left quickly. Upon my first drive I noted a few things that my friend had told me to have addressed. I took it directly to the Mercedes dealership and had them perform any recommended repairs, and told them to only use actual Mercedes parts! A full fluid change was also done off the books as a favor to me. After the servicing was finished I took the car home, detailed it, and parked it next to the 190SL I came home from the hospital in when I was born. After months of blissful ownership I realized I enjoyed the idea of owning the Cosworth more than I did driving it. Much like my 930 Turbos the cars have grown to a value that makes me nervous to drive them. They are only original once, and the idea of a chip or scuff made me cringe! After talking with you and Dean, I knew I had found the perfect caretaker for her! Please enjoy and preserve her to the best of your ability! It will look awesome in your collection! The 16V arriving at Dean’s shop in New Jersey. Dean was blown away by the quality of the car. Its a true original survivor with only 28,000 one fanatical owner miles! What’s in the Garage of President-Elect Trump? 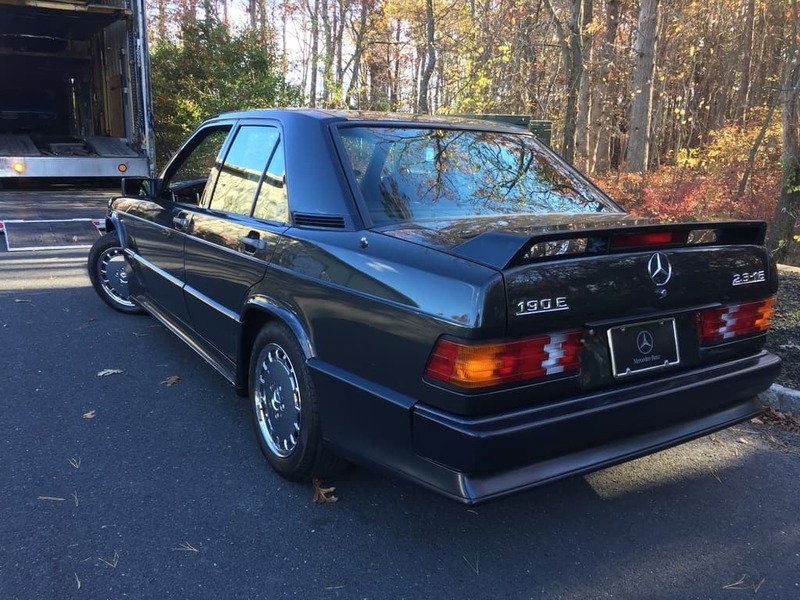 11 Responses to 1986 Mercedes-Benz 190E 2.3-16: The Search is Over! This car is in amazing shape! However there are a couple of down sides when it comes to US version. I brought my car from Japan in 2015 because of absolute absence of decent examples state side, you got very VERY lucky! My car is clocking 33k miles and already has over 10k in parts and maintenance. And the paradox is that i don’t even have tome to drive it. Too bad you can not add pictures here. I got real lucky too. Found a Euro 2.5-16v here Stateside last year. Two owner stock car with full records going back to year of purchase. Beautiful condition, less than 65,000 miles. Sits proudly in my garage. I know what mean when you say ‘their time has come’. People are starting to realize the importance of these cars and the values of ones in good condition are starting to climb…and fast. These cars are very under appreciated in the market. E30 M3’a have taken off and these cars don’t have the same following–yet. Mine looks really good in the garage sitting next to the E30 M3. If you dig into the race history its so interesting. Senna winning that fateful race on the Nurburgring. The E30 M3 actually exists because of the 2.3-16. I think in ten years low-mile investment grade cars like yours are highly desireable. 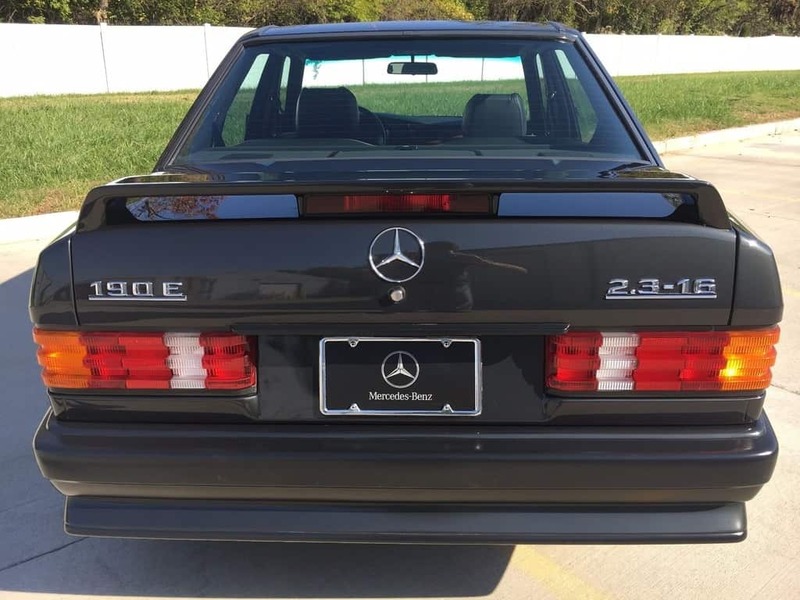 As then-editor of The Star, the magazine of the Mercedes-Benz Club of America, I was happy to attend the world press intro of the 190E 2.3-16 in Germany. At the time, MBNA was importing 80% diesels to the US, so such a high-performance model was a bright ray of sunshine! I recall driving the cars with race-drivers’ names around Hockenheim, and being cautioned by the factory guys to take it easy. We did, for one or two laps, then we had great fun until one luckless driver (a factory employee) stuffed one of the cars into a guardrail. They are wonderful cars. 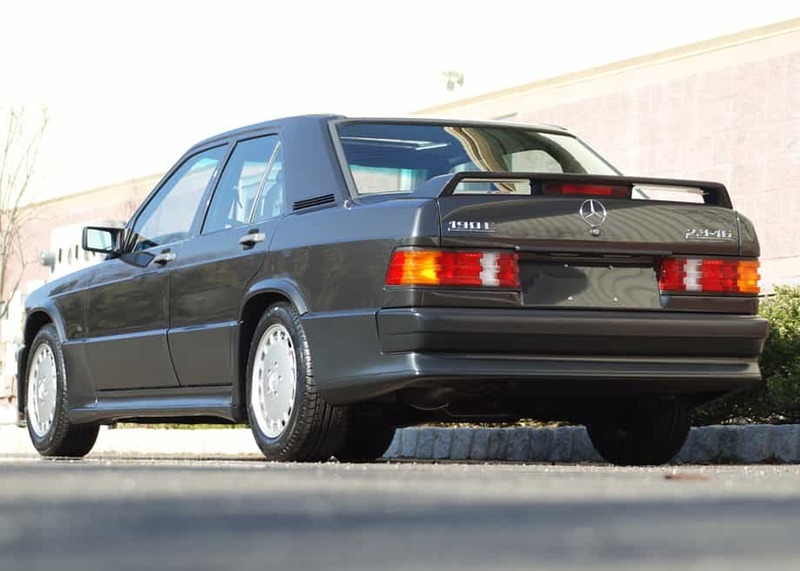 Only exceeded by the 190E 2.5-16 Evo models; a Colorado friend owns one, and we featured it in the magazine in about 2006. Editor of the Star! Now that is quite a resume asset, especially here at the Turtle Garage! 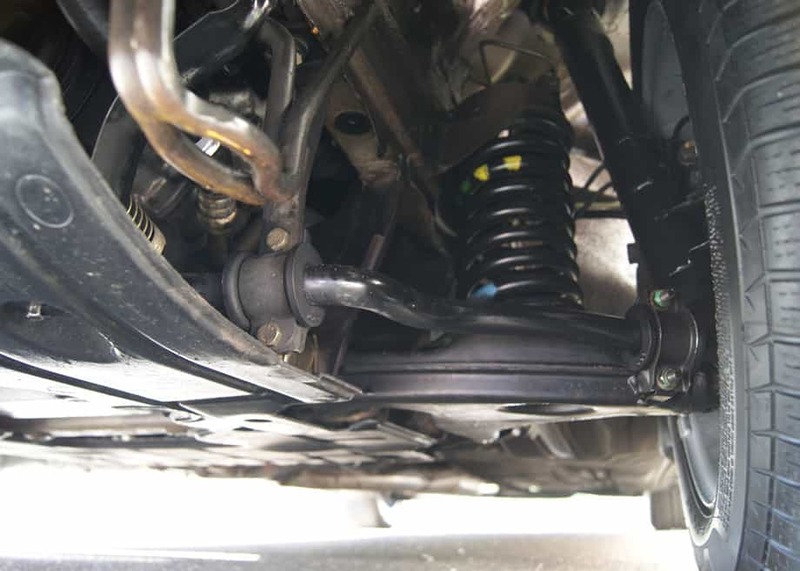 The 190E 16V is a modern classic and its time has come! This car caught my eye back in 1985. I was 15 and saw it on the pages of Car and Driver. Then I saw it at the Auto Show in NYC. Most people drove the wheels off these cars. Less than 2000 were sent to the USA. How many are left with under 30,000 miles in pristine condition? 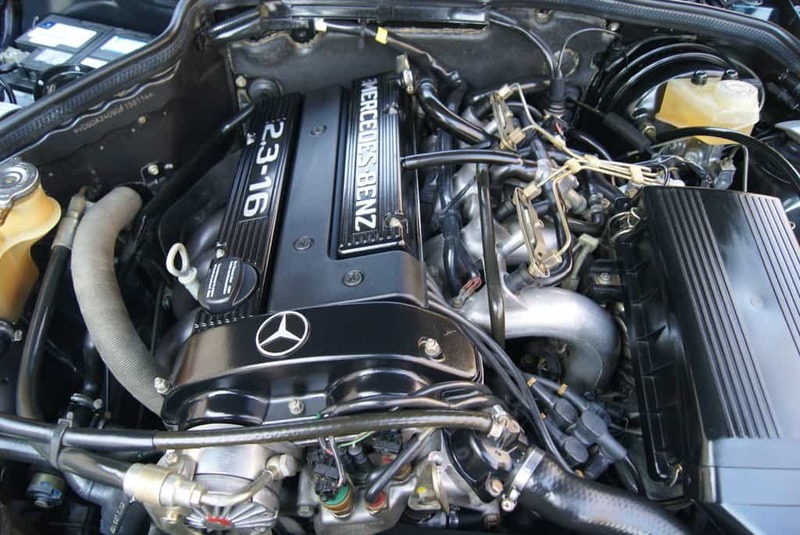 The 190E 16V belongs among the 6.9’s and 500E’s of the modern era. The Cosworth history just adds more intrigue. The car arrives to my garage tomorrow and I can’t wait, just in time for Christmas! my dad had a 190E stick, silver, and he let me borrow it frequently when i was in College in Boston, it was peppy and fun to drive…with a super and infinite third gear, I did many a late night rocket trip Boston-NY with it, but I lusted over the 16 valve which an Italian friend of mine had in Boston. 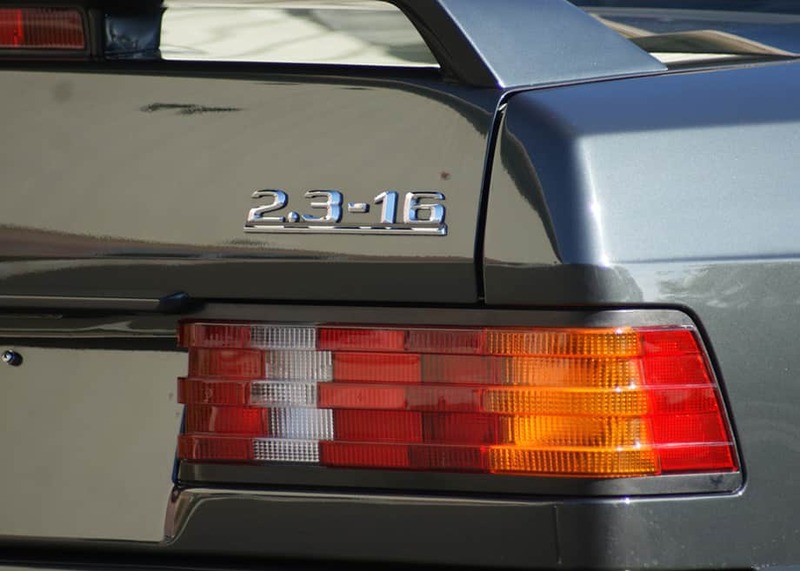 The 190E 2.3 16V is an iconic car. Its time has finally come. What a great story! I can only imagine New York to Boston runs in a 16V! Most of them were used up and driven hard. Very few are left in museum condition. We got really lucky here. Wow! Great car Philip! I can’t wait to see this thing in person. It is literally a needle in a haystack find. Dean is amazing! 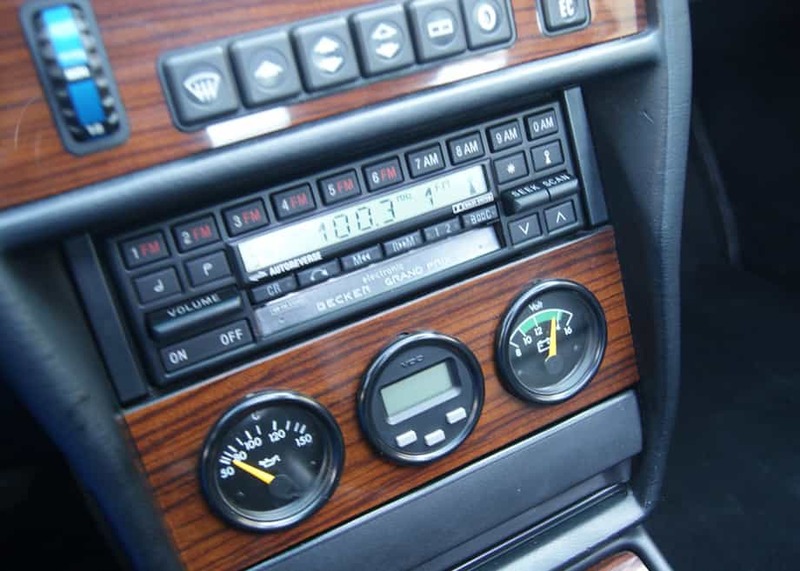 It’s a 30 year old original new car!!! This may be the one I saw recently on Bring a Trailer. But maybe not. Don’t recall the SENNA decal on the door. I do like the size of this thing. Have fun with it. This example was not on BAT. It was in a private collection. The car is Blue Black metallic. They only came in two colors. The photos I used are not of my exact car, except the photo of the rear of the car. 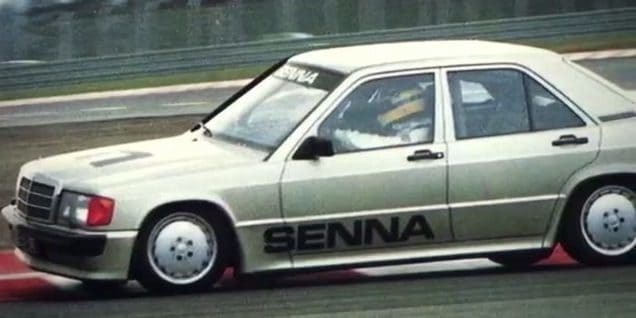 The Senna car was actually raced by him in 1984 on the Nurburgring. It was a who’s who of racers including Lauda, Surtees, Moss and others. Senna won. Its part of what makes these cars have history. The one we found is a unicorn! So excited!